Immerse yourself in the world of scripture as Dr. Amy-Jill Levine shares her vast knowledge, enthusiasm and love of biblical history. You will be fascinated with the background settings she brings to scripture and her ability to add flesh to the many figures we have come to know through the scripture authors. We will host five sessions each comprised of two thirty minute presentations. Each session will include a voluntary sharing time where we get to voice our thoughts and knowledge of scripture. You will absolutely enjoy this scripture scholar! Each session stands alone. Come to one or all and bring a friend. We look forward to seeing you! 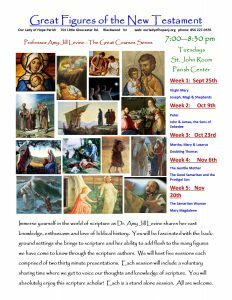 7:00 to 8:30 pm Tuesday Evenings in the St. John Room in the Parish Center. The challenges are great as we mature and the bridge to an adult faith is sometimes difficult unless you are with others who are also on a journey of faith. God has given each one of us our own unique identity and with that also an individual path to a deeper faith. At Our Lady of Hope, our participants set the stage for future offerings. Engaging presentations that include honest discussions allows us to discern what new topics to offer and/or what areas in which to go more in depth. Our events are offered year round including daily and weekend Mass celebrations, Scripture Study, Seasonal Prayer Reflections, Daily Rosary, Book Club and a variety of Religious Studies Presentations. For more details on our ever changing offerings click the appropriate link below. Adult Faith Formation Options to be announced. Check back soon.